Last week’s heatwave probably seems like a long time ago to many of you, especially on wet and damp days such as today. 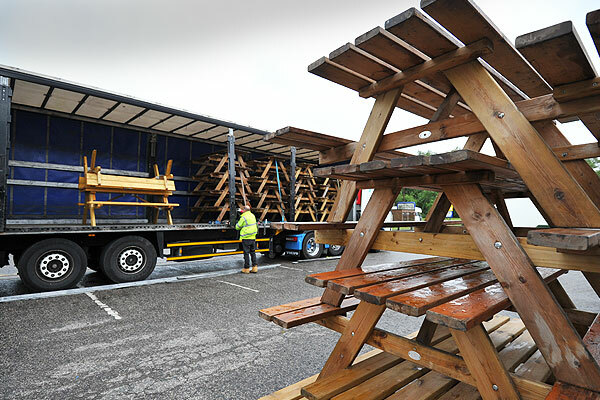 However, this doesn’t stop the Event Hire UK team from loading over 40 picnic benches (pictured) in preparation for a busy weekend on the south coast. Let's hope that the sun makes an appearance! Picnic benches are always in demand in the summer, for obvious reasons, and Event Hire UK has the quantities available to cater for most event requirements. The vast majority of outdoor events will offer some form of catering, whether this is burger vans, baked potato vans, prosecco bars or other type of catering stalls. Whilst this is great, people also need to sit down to consume their food and drink – something which is particularly important for family days, carnivals and other outdoor events. Picnic benches are the ideal solution for outdoor event catering, accommodating up to 6 people on a robust piece of outdoor furniture. When it comes to outdoor furniture hire UK, Event Hire has most angles covered. Our range of furniture hire for outdoors offers something for everyone, whether this is picnic benches hire, outdoor rattan furniture hire, patio heaters, BBQ hire, gazebo hire or simply plastic and hardwood patio sets hire. This range, combined with the quantities and the quality of outdoor furniture, makes Event Hire UK one of the leading suppliers of outdoor furniture rental in the country. Why not find out for yourself today why event organisers turn to Event Hire UK time and time again to source everything they need for their upcoming events. Our logistics teams will work with you to help ensure that you receive the event equipment you need in the quantities you need and at the prices you need to make your event a huge success. We work tirelessly behind the scenes at events all over the country to produce fantastic occasions, and so get in contact today – we will be delighted to assist.